Ron is the youngest son and next to the youngest child of Arthur and Molly Weasley. Arthur works at the Ministry of Magic in the Misuse of Muggle Artifacts Department. Molly is a homemaker (as far as we know). Both are members of Dumbledore's Order of the Phoenix, working to fight against the evil plans of the self styled dark lord, Voldemort. The other Weasleys are Bill, Charlie, Percy, the twins Fred and George, and Ginny. Ron's best friend is Harry Potter. Ron's other best friend and one true love is Hermione Granger. Ron was one of the keepers on the St. Emrys University team The Manticores. 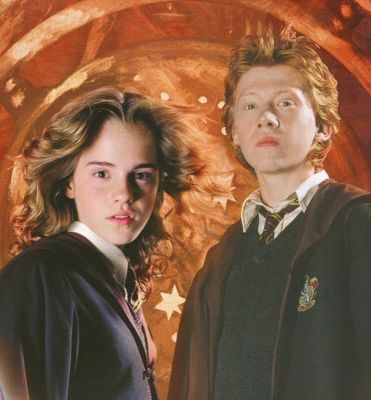 Ron had to work hard to win Hermione back after she dumped him just after Valentine's Day 1999. At present, Ron does a little work for Whizzhard Books, has done anonymous Agony Aunt column work for the Daily Prophet as Aunt Aggie, helps out with the various family businesses, and works full-time as an Auror at the British Ministry of Magic. On Easter Sunday, 27 March 2005, Ron married one of his best friends and long time love Hermione Granger in a ceremony at the Burrow. They welcomed Rose Granger Weasley into the world October 9, 2006. Son Hugo joined the family 25 August 2010.